Fresh cherries and strawberries are amazingly tasty this month, holding their own flavorwise against a rich chocolate dessert. 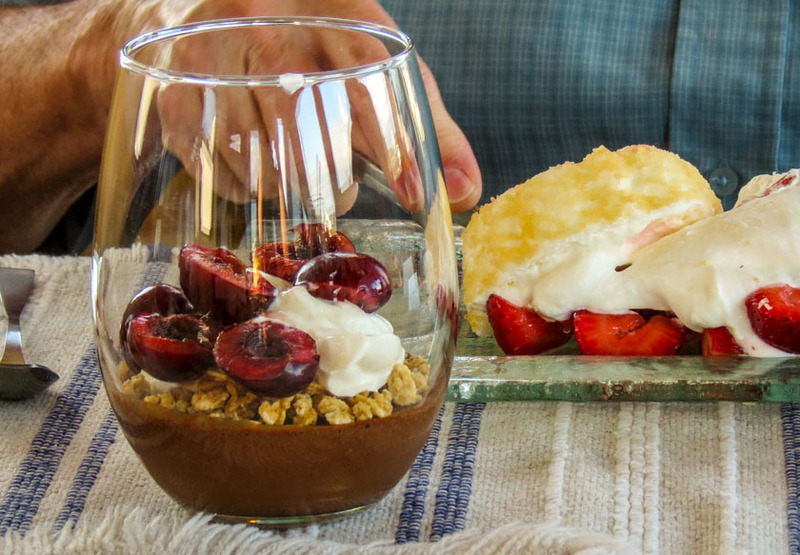 This chocolate mousse doesn't need fruit to be a winner, it is a terrific standalone dessert any time, but sweet cherries added a delicious fruity note. The small serving shown above packed a big flavor punch, always a good thing, and left room for the accompanying strawberry shortcake. Yes, we ate them both. Last night was a dessert evening with boating friends Sharon and Gary (M/V St. Helena), a time to skip dinner and plan to indulge without guilt. Well, no guilt was the plan, but reality caught me anyway. Just that morning I had carried on at length to friend Nikki that I was cooking healthier and eating less this year, focusing on filling our small plates more with fruits and vegetables than carbs and sauces. It's true, most of the time. Guess who walked down the dock last evening and caught me indulging in two desserts?! Busted! Hey, both items had a fruit to go along with the whipped cream, chocolate mousse, etc. Fruit and dairy should count for some good points... maybe not. If you are looking for an easy chocolate dessert for family or company, one that uses ordinary galley ingredients and looks impressive, you will want to whip up this recipe. Variations of the recipe are found all over the internet. You could search "chocolate chip mousse" and explore the 4.7 million hits that pop up, or just give this recipe a try. Then tweak it to suit your taste and create your own version. Layer in your favorite combinations for crunch, sweetness and fruity flavor - go ahead, play with your food! Place the chocolate chips, eggs and flavoring in a blender or food processor and whiz a bit to chop up the chips and incorporate all. With the blender running add the coffee in a slow stream through the hole in the lid. Blend for several seconds until the mixture is smooth. Pour into small ramekins, custard cups, jelly jars or wine glasses and refrigerate for at least 2 hours to firm up. The mousse is good as is, but adding layers of granola, Greek yogurt with honey or whipped cream and chopped fruit or candied peel turn this into an irresistible showstopper. Note: the recipe doubles well, utilizing a full 12-oz bag of chocolate chips. I love to read your comments so please leave a friendly note. Comments are moderated so it may take a while to appear.